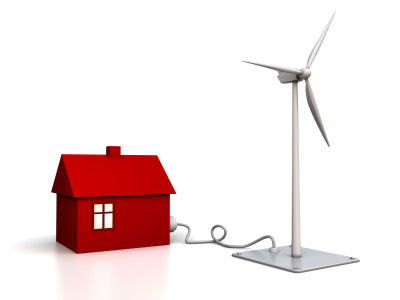 By installing a residential wind turbine you can generate electricity and income. One thing we’re not short of in the UK is wind! A residential wind turbine will capture energy from the wind and convert it into electricity. If your home is in a suitable location, installing one adds another string to your renewable bow and any excess you generate can be sold back into the grid. The fluid flow of the wind contains kinetic energy. Some of this energy is transferred to the wind turbine as the wind travels over the turbine’s blades causing them to rotate. The mechanical energy created by turning the rotor is converted into electrical energy using a generator within the turbine. Residential wind turbines can be roof mounted or mast mounted. Mast mounted systems are larger and capable of generating more power than the smaller roof systems. Wind speed increases with height and the additional height of the mast can tap into this. The more wind there is and the higher the wind speed, the more power you can generate. Unless you are building in a location without access to the grid or would prefer remain ‘off-grid’, the common option is to connect the system to the electricity grid. Excess power generated at peak times can be exported to the grid and bought back by your energy supplier. Any shortfall in your own energy production can be supplemented by grid-supplied power when there’s no wind. Excess energy generated can be sold back to energy companies through the Feed-in Tariff scheme which was introduced by the Government as an incentive for electricity microgeneration. Find out more about the scheme and the rates on the Ofgem website. Unfortunately wind turbines are not suitable for all locations. Average wind speeds vary around the country and an annual average of at least 5m/s is required to make installation worthwhile (DECC). It is also necessary for a residential wind turbine to be located in clear air away from any trees, buildings or other obstacles that can create turbulence. Contact a Microgeneration Certification Scheme MCS certified installer who will visit and survey your site or home to see if a residential wind turbine is a viable option. Despite the fact that the installation of most microgeneration technologies is (subject to guidelines) within permitted development rights, domestic wind turbines are not and you will therefore need to contact your local authority about the planning requirements. Visit our eco homes section for other ways to make your home more sustainable and have a look through the rest of The Self Build Guide for more information on building your own home.